The facility is the first in King County to offer both addiction treatment and mental-health services. 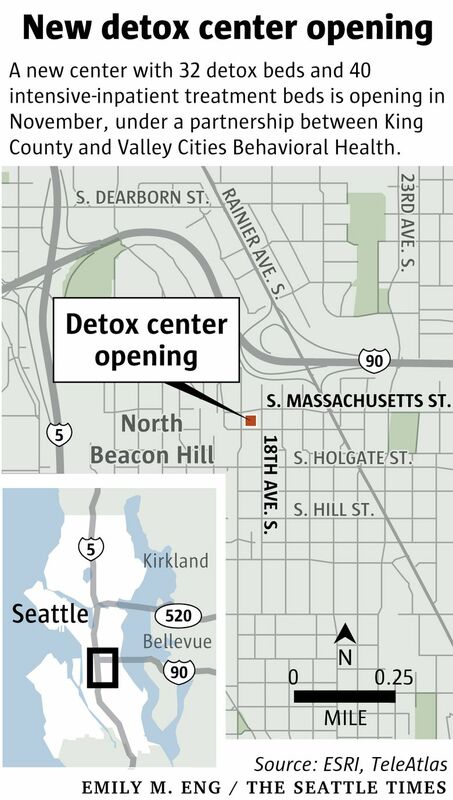 King County officials on Thursday celebrated the opening of a new detox facility on Beacon Hill, filling a critical gap in the region’s drug-treatment system as the county’s opioid and heroin crisis has spread. The new detox facility, run in a partnership with Valley Cities Behavioral Health Care, will be the first to offer both treatment for addiction and mental-health services for the homeless and those with lower incomes. The Recovery Place Seattle at Beacon Hill will begin accepting patients in early November, starting with 16 detox beds. That will eventually expand to 32 detox beds and 40 intensive-inpatient treatment beds, once the center is fully staffed, said Valley Cities’ CEO Ken Taylor. The center will initially accept referrals from area hospital emergency rooms, but that will eventually expand. King County Executive Dow Constantine said beds will be prioritized for patients coming from the city’s Navigation Center, a recently opened, 24-hour homeless shelter. Detox patients will be housed on the building’s first floor. Following detoxification, which can take three to five days, patients will be encouraged to move upstairs for psychiatric treatment and behavioral health counseling, and where they can remain for 10 to 28 days. If they refuse, Valley Cities will try to connect them with services outside the facility, said Milena Stott, Valley Cities’ chief strategy officer. Purchase and renovation of the property, at 1701 18th Ave. S., cost nearly $13 million, with $1 million coming from King County, $3 million from the Washington State Housing Commission, $1 million from the Norcliffe Foundation and $1 million from the state’s energy efficiency incentive program. Valley Cities put in some of its own money to cover a project funding gap and also took out a $4.5 million loan to finish the project. Taylor hopes that the state’s capital budget — which is held up in Olympia due to a partisan dispute — will include $2 million earmarked for the Recovery Place to pay back part of that loan. However, Taylor said Valley Cities is prepared to service the loan if the capital budget is not passed with the earmark. The operation budget for Recovery Place will run about $5 million annually, much of it funded through a contract under which King County will pay Valley Cities for patients receiving Medicaid, Taylor said. King County had a shortage of detox beds when Recovery Centers of King County abruptly shut down its center in 2015 amid financial troubles. King County has contracted for detox beds to fill in the gap, but advocates for homeless people say there are waiting lists for services. The number of drug-overdose deaths hit an all-time high in King County in 2016 with 332 deaths, two-thirds of them due to opioid abuse.